I was surprised to see that I have never included L'Artisan Parfumeur's signature scent, L'Eau de L'Artisan, in a Top 10 of Summer article. This 1993 fragrance by perfumer Olivia Giacobetti has long been one of my hot weather staples, and it is one of very few bottles in my collection that I drain and replenish on a regular basis. 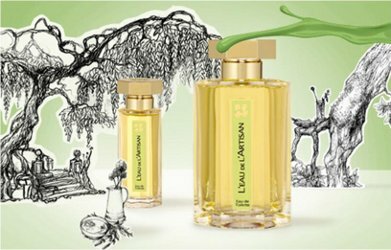 L'Eau de L'Artisan's opening is bright and crisp, with lots of sharp verbena (the notes: lemon, verbena, basil, mint, tree moss, hay, seaweed). Dry green herbal notes chime in almost immediately, after that, you get what smells like freshly cut grass soaking in warm, salty seawater. It is this latter accord that sets L'Eau de L'Artisan apart from the many greenish, citrusy "house eaux" on the market, and makes it one of those hot weather fragrances that I love to wear in mid-February, when I need a little reminder that summer will get here, eventually. It's a clean fragrance (I don't find it soapy, but some people do) and very fresh, but without a big huge synthetic "fresh note". It is not the place to go looking for complexity — it runs through its paces in about 15 minutes, after that it's essentially linear until it fades away, and the lasting power, as with any summer Eau, is not fantastic. You will need to bring some with you to refresh, or you can do as I do and take advantage of its departure to switch fragrances mid-day. L'Artisan Parfumeur L'Eau de L'Artisan is available in 50 and 100 ml Eau de Toilette. For buying information, see the listing for L'Artisan under Perfume Houses. More grassy citrus: Calypso Tangerine, Christian Tortu Eau Fraiche. Oh Robin… Please do a review for Premier Figuier. I Love L'Artisan but unfortunately the stuff evaporates as soon as it hits my skin. I will still look for a sample of this only because I love the summer fragrances that you choose! I get a couple hours if I spray it on lavishly (2 sprays on each arm, which for me is lavishly). That's it. But that's how it goes w/ most summery citrus things, so I live with it. You're right though that lasting power is not generally a L'Artisan specialty. Yes I am just about to come to reading that. When I began to wear it, it was the newly cut grass sensation I fell in love with. Now I guess it is more about how fresh and uplifted it always makes me feel, sunshine in a bottle really. No huge excitement or changes in it really, but trustworthy. Sometimes I get a slightly flowery feel from it, but not in a very pronounced way. It is slightly flowery, and if you put enough on to make it last, it's also fairly woody. But it is the seaweed-y part that really makes me love it, I think. I wish I had bought the men's discovery set when they were still selling it so I'd have a 5 ml bottle for my purse. You had me at verbena and nearly lost me at seaweed. Still, I now must try it. If 2 per arm is lavish then I am Queen of sybaritic excess. I go to town with the short-lived TDC Bergamot, like, ALL OVER. Probably 3 per arm, rub in, one more squirt just in case, neck, front and back, upper chest, then dress, ok one more squirt for the road. Of course, this is a light scent, and it's summer, and hot, and I would never ever do this with something like Fracas or heavens, SL Arabie, say. That much stuff would cause kill all bugs in vicinity and possibly make the dogs pass out. Love this scent – it was one of my first decants I ever bought, when I started buying decants. It also filled that niche that Grass by GAP used to fill, and now that Grass is much harder to find due to it being discontinued, I always recommend LedA to newbies asking me for a summery, grassy, fresh fragrance. I get atleast a couple hours of longevity – if I over apply (more than 6 sprays). Oh and BTW I get no seaweed from this on my skin. I love this frag for summer, but it doesn't last more than 4 hours on me. I usually combine it with the Magie Noire body lotion, which gives it depth and more staying power. Love this one and I'm glad that you do, too. I bought Anisia Bella unsniffed after your review and loved it as well but was surprised by how similar they are. At least I find them similar but I'm a newbie and haven't sniffed that much! Another to enjoy, in this vein, is Jo Malone 'Living Cologne' [ am I the ONLY one, who thought this was for skin, lol?!] in Basil/ Verbena. You can put it all over your skin and clothes, and it's gorgeous- and fleeting. But it's cheaper , with more volume, so go HOGWILD…! Funny – if I try it, I'm thinking I'll have to get through the verbena and that maybe the seaweed will make it worth it! I must try this! I've tried a few other fragrances from L'Artisan, but I had no idea there was a L'Eau de L'Artisan! 3rd Shift: I wear scent REALLY lightly, as in, if someone else can smell it, I'm wearing too much. So I'm not a good marker. Yes, I get a couple hours too. Maybe even closing in on 3, if I'm lucky. You know, I just received my full bottle of AdP Fico di Amalfi, and your'e reminding me that I haven't even tried PF yet and it's just about the last holy grail fig I need to add make my collection complete (with Philosykos and Jardin en Mediterannee). Of course there's also the CBIHP scent, Revelation, and probably at least half a dozen others…. I was lucky enough to get a half bottle of this in an auction when I was really after Timbuktu, and I definitely enjoy it a lot. I agree with others about the fresh-cut grass accord, and something unique, which must be the seaweed, though it's nothing like CSP Aqua Motu. I also get nothing that I could discretely identify as lemon, verbena, mint, or basil on their own, but an overall well-blended “fresh” feeling from it. I'm a big fan of Gap Grass but this is a notch above and a bit more complex smelling than a linear “hay” scent. I'm probably an “overapplier” in the manner of Third Shift, but this actually has amazing lasting power on me, and I often smell it on my clothes for a good long time. Great review. Everyone should have a small bottle of this if fresh-green-herbal-grassy is your thing, and it's certainly one of mine. I was just looking today at how huge the L'Artisan line has gotten…it is hard to keep track of them all. I do wish they still sold the 15 ml bottles, it would be easier to maintain a decent sized L'Artisan collection! No, nothing like Aqua Motu — and that one, although I do love it, smells entirely synthetic. This one has a more “realistic” or “natural” approach. Eau de Guerlain is in a class by itself — that one was included in my very first Top 10 of Summer. I do worry about what will happen to it if/when they take out the oakmoss. The Chanel is lovely too but I haven't felt the need to buy it. Ohh I love that scent, (Gap Grass) & wore it frequently. It does sound enticing for summer! I really like this one because all well as being redolent of grass and leaves, it is salty without having fake aquatic notes. The lovely sales assistant in the Chelsea shop said that it is one of the most popular with a celebrity following. Although then she told me the one who came in the most to buy it regularly was Tamara Beckwith which wasn't particularly impressive! I didn't buy it but I got a sample just in case I wanted to buy it later. Excuse my ignorance, but if/when removing oakmoss? Is there an issue with oakmoss? Premier Figuier Extreme is one of my favorites. I'd love to read a review. The Extreme is creamier, richer and less jarringly “leafy” than the original. Both are great. I am obsessed with fig these days. It all started with my fig room diffuser I got in my Henry Bendel gift bag at last fall's Sniffapalooza. She's probably only famous in the UK: She's an upper class socialite who was on reality tv and dated Sly Stallone. But she has good taste in scents apparently. I've got addicted to your blog btw as well as a couple of other perfume blogs…thanks for writing! Just wanted to say Thanks for inspiring me yesterday to wear L'Eau today! Between this and Philosykos, I am happy to stand by my choice of Giacobetti to creat my fantasy bespoke perfume! She is wonderful, you picked well! Both of those are worth trying! My brother described Premier Figuier as “wet coconut matting” and I kind of know what he means – there is a very fine line between matting and fig in fact. I went back and reread this after just buying my first big bottle of L’Eau de L’Artisan. (I bought a travel size of it way back around 2000, when the bottles were still round and not faceted, but I drained that long ago.) For me this scent fills a very particular niche: It is one of the very few that I can tolerate on those days when the heat and humidity are so oppressive that they make me feel queasy. I attribute this quality to its utter dryness (absolute lack of sweetness), which I attribute in turn to the prominent seaweed/salt water note. For me, its only competition in this limited category is O de Lancome. So Robin you suggest it for a summer scent? Never smelled it but does not seem to be very special.. there are a lot of citrus fragrances, this one should be my selection? I dont want feminine citrus by the way. I have no idea if you’d like it, but I like it, and it’s not feminine.